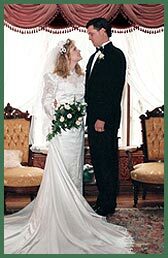 Eureka Springs Arkansas Christian Bed and Breakfast Wedding Chapel Angel at Rose Hall. Victorian Mansion located in the Historic District of Eureka Springs, Arkansas. The Angel at Rose Hall, a Christian Bed and Breakfast in Eureka Springs, AR, is a magnificent recreation of an 1880’s historic Victorian Mansion perched on Hillside Avenue, the gateway to Eureka Springs’ historic district. The Angel is the only Eureka Springs Bed and Breakfast to be awarded the coveted and prestigious 4 Diamond AAA rating and is considered “in a class of its own”. Free High Speed Internet Access! 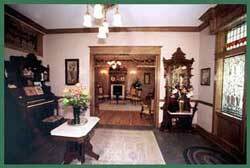 As you stroll up to the front porch of our Victorian B&B you will feel as though you have stepped back in time. Step back onto the scents and sights of yesteryear with garden and valley views, sounds of birdsong, celestial surroundings and luxurious comforts. Inside the main entry elegant Victorian antiques and century old stained glass windows await you. Each of our guest rooms and suites has a distinctive look, all with their own unique charm. Rates are $135 - $219. 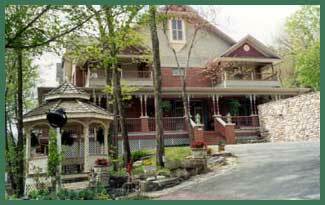 A blend of Victorian elegance and warm hospitality makes the Angel at Rose Hall Christian Bed and Breakfast Wedding Chapel, a wonderful place for your Eureka Springs getaway. We specialize in weddings, honeymoons, anniversaries, vow renewals, romantic getaways and special birthdays. View our elegant wedding cakes. Nearby Arkansas attractions are: The Great Passion Play, horseback riding, museums, shopping, walking trails, golf, two large lakes, white water, canoeing, biking, great dining, Thorncrown Chapel and only one hour from Branson, Missouri.